Malcolm Jameson was an American writer whose living career lasted from the late 1930s to the mid-1940s, during the Golden Age of science fiction. During that time he published more than seventy-five stories in pulp magazines, ranging from space opera to speculative fiction to fantasy, and his work continued to be published in anthologies after his death in 1945. His best-known work includes a story that was adapted into a Twilight Zone episode; the short story “Doubled and Redoubled,” considered the first work of fiction to use a time loop as a plot device; and the posthumously published novel Bullard of the Space Patrol, which F&SF editor Anthony Boucher included in his seminal list of the fifty-two best science fiction books ever written. 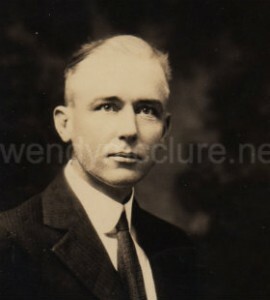 Jameson was born in 1891 in Waco, Texas, the eldest of three siblings. Throughout his childhood his family moved frequently to follow the career of his father, Joe Lee Jameson. The family lived for a time in the staff quarters of the Southeastern Texas Insane Asylum in San Antonio, where Joe Lee was bookkeeper and steward, and by the turn of the century they were in Austin, living across the street from the state Capitol. There, the elder Jameson was entrenched in Texas politics, working as the state revenue agent and as an aide to governors Joseph D. Sayers and S.W.T. Lanham; political kingmaker Edward M. House, who would later become the foreign policy advisor to President Wilson, regarded Joe Lee Jameson as his right-hand man. Despite these connections, the first few years of the new century were difficult ones for the Jameson family. In 1900, Malcolm’s younger sister, Vida, died suddenly of meningitis. Just four years later, when he was twelve, his father, by then an oil company executive, passed away from typhoid fever. By the time Jameson reached young adulthood he had, by his own reckoning, lived in most of the major cities in Texas. He began to study civil engineering at the university in Austin, but at the age of twenty he moved to San Francisco, where he worked as a hotel clerk while trying to finish his education at the School of Architecture at the University of California at Berkeley. By 1913 he was working various civil engineering jobs in Texas, overseeing county highway and other construction projects. In 1915 Jameson married Mary MacGregor, the daughter of a doctor who had been superintendent of the same insane asylum where his father had worked. A year later, he enlisted in the Navy and began work in Washington, D.C. He became chief draftsman and soon specialized in ordnance tests, developing the use of surveying cameras to measure the range of shells fired in target practice. In the ensuing years his international duty took him to England, Cuba, Norway, Sweden, Spain, China, Guam, and the Philippines, and the ships he served on included the U.S.S. Lebanon, the Minnesota, the North Dakota and the submarine O-8. He had two children with Mary: Vida, who was born in 1916 and named for the sister he had lost, and a son, Malcolm MacGregor, in 1919. He retired from the Navy in 1926, at the age of 35, following a diagnosis of throat cancer. Radiation treatments and other measures managed to keep his condition relatively stable, and for much of the next nineteen years he continued to work. His jobs ranged from filling station proprietor to life insurance salesman to recruiter for the International Correspondence Schools. In 1929 Jameson and his family moved to New York City, where for a time they shared an address on East 48th Street with his younger brother, House Jameson, an actor later known for his role as Mr. Aldrich on the radio and TV show The Aldrich Family, and House’s wife, Edith Taliaferro, who had a career on the stage and in silent film. During the 1930s, while still working as a salesman, Jameson began searching for creative outlets. Initially he drew on the fine art background he’d had as part of his college studies and began creating pieces he called “Segmaps,” which he made by burning designs inspired by antique maps onto wood, using heated tools and Mercurochrome. While these works were exhibited in New York and earned Jameson a brief write-up in Time magazine, few were sold, and by 1936 he was exploring another avenue: fiction writing. His first publication was in 1938 to Astounding Science Fiction, the leading science fiction magazine of the day, with the story “Eviction by Isotherm.” Jameson soon became part of acclaimed editor John W. Campbell’s stable, publishing dozens of stories in Astounding and its companion fantasy publication, Unknown (later known as Unknown Worlds). His work also appeared in Weird Tales, Astonishing Stories, and Thrilling Wonder Stories, among others. In New York he was acquainted with writers such as Frederik Pohl, Robert A. Heinlein, L. Ron Hubbard, L. Sprague de Camp, C.M. Kornbluth, Henry Kuttner, and C.L. Moore. Several accounts of the Golden Age era recall Jameson among a group of writers and editors who met on Thursdays at a restaurant near Times Square during the early 1940s. Vida Jameson, by then in her twenties, became known among sci-fi circles as well; in later years she would publish her own fiction and was briefly married to writer Cleve Cartmill. In the years after his death, several of his stories were reprinted in anthologies or repurposed as inexpensive paperbacks. The only hardcover to be published under his name was the fixup novel Bullard of the Space Patrol, which compiled the stories featuring one of Jameson’s most popular characters, John Bullard, into a continuous narrative. Bullard was edited by Andre Norton and published in 1951 for a juvenile audience. A decade later, Rod Serling adapted Jameson’s 1943 story “Blind Alley” into a Twlight Zone episode, “Of Late I Think of Cliffordville,” which aired in April 1963. Jameson’s name continued to appear in print in the 1970s and beyond when many of the anthologies featuring his work were reissued as paperbacks. Today, with several of his stories available online and in ebook form, Malcolm Jameson’s work is being discovered by new generations.